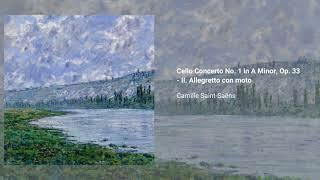 The Cello Concerto no. 1 in A minor, Op. 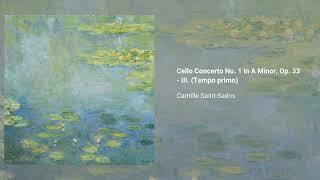 33 was written by Saint Saens in 1872. Though most known for his traditional-style works, the composer made the whole concerto in one flowing movement, itself consisting of three fused parts linked through clever transitions. It premiered in Paris in 1873. 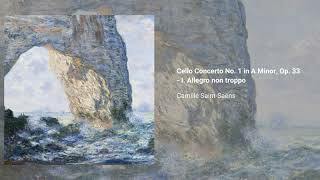 Many composers, including Shostakovich and Rachmaninoff, considered it to be the greatest of all cello concertos. After the complications and difficulty of writing it, he vowed never again to write a concerto for cello because he found it too "restrictive." However, he did write a second and less popular cello concerto. The flow of the piece itself is unusual: for example, instead of the traditional orchestral introduction, the piece begins with one short chord, followed by the cello stating the main theme.